Gov. Mike Parson has appointed fellow Republican Mike Kehoe of Jefferson City to serve as Missouri’s new lieutenant governor. Kehoe, who has held the state Senate Majority Floor Leader position since 2016, is term-limited and is serving his final year in the upper chamber. During today’s swearing-in of Kehoe, Cole County Circuit Judge Pat Joyce, a Democrat, administered the oath of office. Parson and Kehoe served together for several years in the Senate before Parson launched his campaign for governor and later decided instead to run for lieutenant governor. Earlier this month, Parson assumed the position as governor after several months of scandal centered around Republican Eric Greitens and ultimately led to Greitens’ resignation. Kehoe’s name has surfaced in recent weeks as Missouri’s potential second in command. He is known for his cool, calm and collected attitude and is well-respected among his colleagues on both sides of the aisle. Kehoe’s background includes running Linn, Missouri-based ambulance manufacturer Osage Industries. He also owned and operated the Ford and Lincoln-Mercury dealership in Jefferson City for 20 years. His family continues to work on their farm on the Gasconade River in mid-Missouri’s Phelps County. 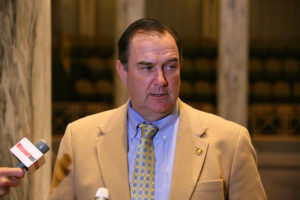 In 2005, Kehoe was appointed by Republican Governor Matt Blunt to serve on Missouri’s Highway and Transportation Commission, which governs the state Transportation Department (MoDOT). In 2009, he was elected to be its chairman. Some Missouri elected officials and their staffers have been examining what path can be legally taken to fill the lieutenant governor’s seat since Parson vacated the job earlier this month. Missouri statute and the state Constitution don’t establish a line of succession for the post. The governor appoints a replacement for every other statewide elected position that becomes vacant in Jefferson City.